Hello Doodlebug friends! It's Monique sharing a layout featuring some of Doodlebug's awesome Chunky Twine. I'm a huge fan of all the string art projects you see around the net nowadays and I have been wanting to give it a try too for quite some time now. I started by printing (not cutting) a fun string art heart cut file from The Cut Shoppe and placed this on top of my white cardstock. Using a paper piercer I punched lots of little holes through the printed heart and into my white background cardstock. Next I removed the sheet with the printed heart and placed it visible on my desk and started hand sewing the heart with the printed heart as my example. Super easy! I just love the effect of the chunky twine on my layout. And as I'm a huge fan of all of Doodlebug's shaped sprinkles I decided to use those to fill in the white spaces of the heart. Next I built the rest of the page around this heart. 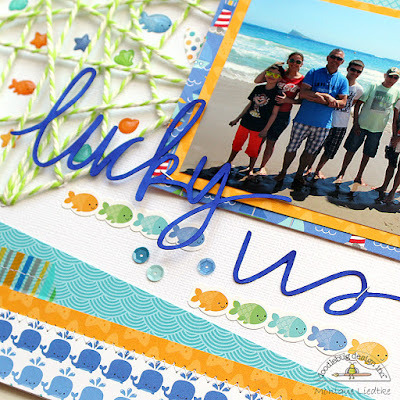 The photo came first, then the strips of paper and washi tape at the top and bottom of the layout and last but least the rest of the embellishments, like the little Wally whale doodle-pop and the sequins. 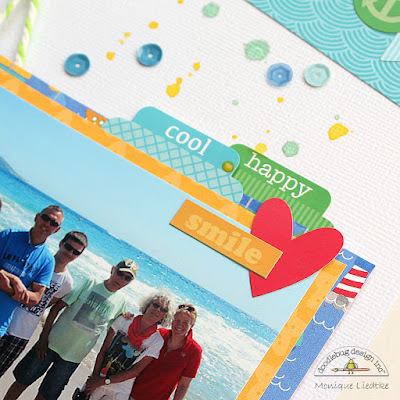 I used my Silhouette Cameo to create a title for my layout. Initially I cut a white title, but decided later-on I wanted a dark blue one and hand colored it. 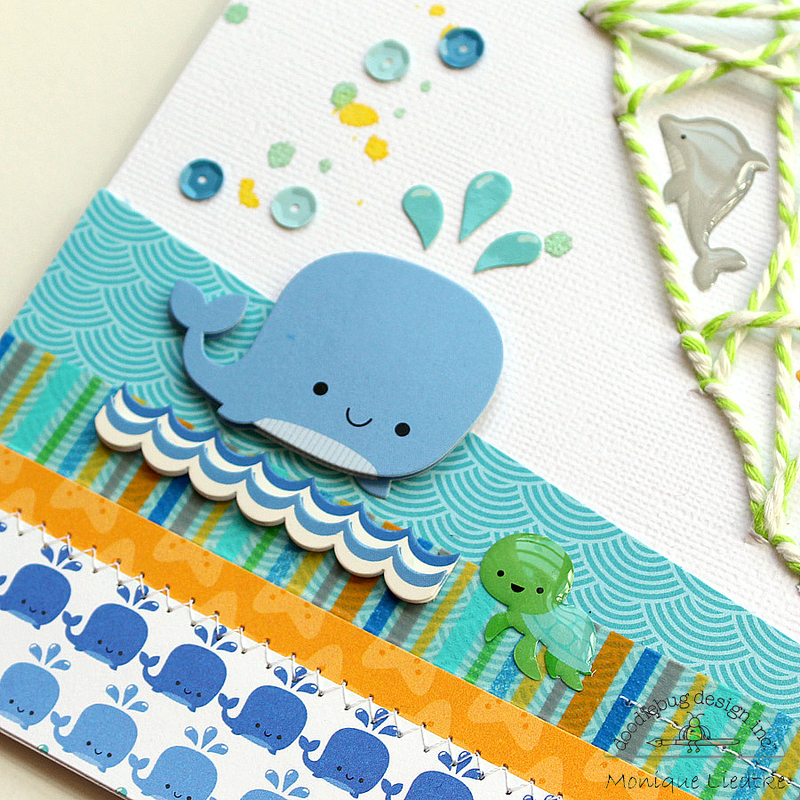 Thank you so much for taking a peek at my Chunky Twine project today! Have a great day! 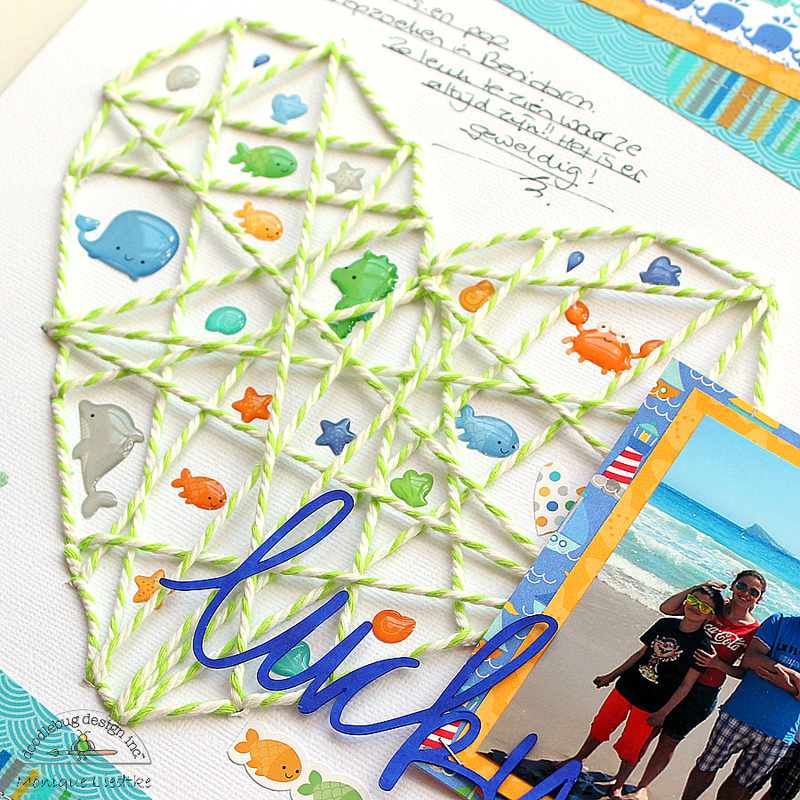 WOW - Monique, You are so awesome and this is the coolest idea with this chunky twine - love that you used the sea sprinkles int he spaces created by your really cool stitched geometric heart!! Very cool!! This is such a clever design! Awesome use of the chunky twine! 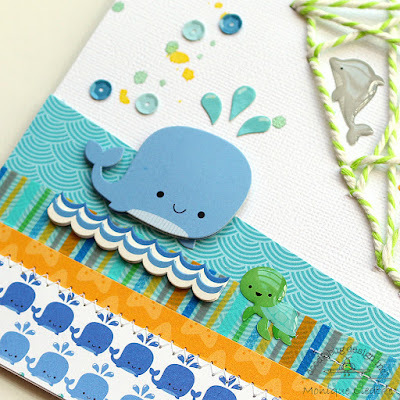 I love all the added details like the shaped sprinkles, sequins, patterned strips...so many fun things to admire. Die is ook al zo leuk. Wat een werk. Resultaat is heel mooi geworden. 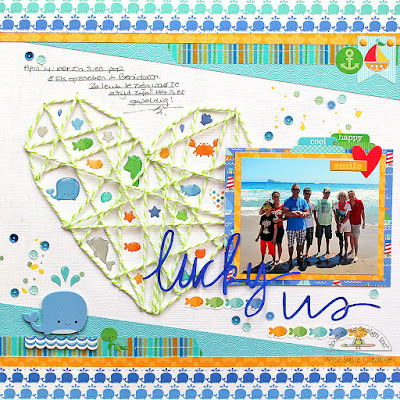 Leuk die doodlebug shapes overal tussendoor.